Insulinoma is a pancreatic endocrine tumour which origins from beta cells and characterized by excessive insulin secretion and hypoglycemia due to this. Symptoms seen in hypoglycemia are due to brain’s lack of glucose (neuroglycopenia) such as somnolence, irritability, confusion, abnormal behaviour, epileptic seizure and even coma. In this study, we presented two insulinoma cases who applied to our clinic with neuroglycopenic symptoms. Patients followed up with epilepsy diagnosis were referred to us because of low blood glucose rates. Hyperinsulinemic hypoglycemia in the prolonged fasting test and a mass in pancreas were detected in both patients and so they were diagnosed as insulinoma. The mass was excised by laparoscopic ways in surgical clinic and patients clinic were completely recovered postoperative. In conclusion, it is necessary to determine whether there is an underlying organic brain lesion or a metabolic condition in order to prevent long-term use of unnecessary antiepileptic in patients presenting with seizures. Diagnosis of insulinoma is usually delayed because of non-spesific indications. Adrenergic and neuroglycopenic symptoms are seen when hypoglycemia occurs. There may be a long period between the onset of symptoms and the diagnosis. Because of neuroglycopenic symptoms, patients can be followed-up and treated with misdiagnoses such as epilepsy or psychosis in neurology or psychiatry clinics (1). In this case report we wanted to remind and emphasize the existence of two insulinoma cases who applied to the neurology and psychiatry clinics before diagnosis and who used long term un necessary antiepileptic drugs due to misdiagnosis of epilepsy or psychiatric disorders. Sixty-six year old female patient, she had the complaints of getting fat, sweating, palpitation, seizure and fainting. The patient began to use antiepileptic drugs with the diagnosis of epilepsy, three years ago. The patient’s seizure frequency had increased in the last 3-5 months and seizures become uncontrollable with the drugs. The patient was referred to our clinic with the prediagnosis of insulinoma after they measured fingertip blood glucose 26 mg/dL in the emergency service when she applied with neuroglycopenic symptoms. Her fasting blood glucose was measured as 60 mg/dL after biochemical tests. At the 4th hour of the prolonged fasting test the insulin value was determined as 28.4 (6-27) IU/dL and c-peptide: 5 (1.1-5) IU/dL while blood glucose was measured as 30 mg/dL. These findings were biochemically suitable with insulinoma. Pancreas ultrasonography, magnetic resonance imaging (MRI) and tomography were performed to the patient and tumour could not be localized in the pancreas. Endoscopic ultrasonography reported 11x7 mm mass in the tail zone of the pancreas (NET?). Patient under went to operation in our general surgery clinic. Immunohistochemical studies in the pathological examination of the fragment revealed that the resulting tumour was a well differentiated endocrine tumour insulinoma carrying low-grade malignancy potential. Post-operative follow-up showed a blood glucose level of 110-150 mg/dL and there was no epileptic attack in the last 3 months. Informed consent was obtained from the patients. Fifty-seven year old female patient was admitted to the emergency center clinic with the complaints of palpitation and weakness. She was referred to our endocrinology clinic because of low blood glucose level (45 mg/dL) during the examinations. About three years ago patient was diagnosed as epilepsy in the neurology center due to the complaints of fatigue, loss of concentration, excessive nervousness, trembling in hands, glazed eyes, cold sweating, fainting, palpitations and treated with levatiracetam 2x500 mg, lamotrigine 1x25 mg. There was no decrease in complaints and seizure frequency of the patients on the follow-up. We made prolonged fasting test to the patient. We detected insulin: 68 uIU/mL, c-peptide: 5.1 mg/mL, cortisole: 15.3 mg/dL, at the third hour of the test while blood glucose level was 45 mg/dL. These findings were biochemically compatible with insulinoma. 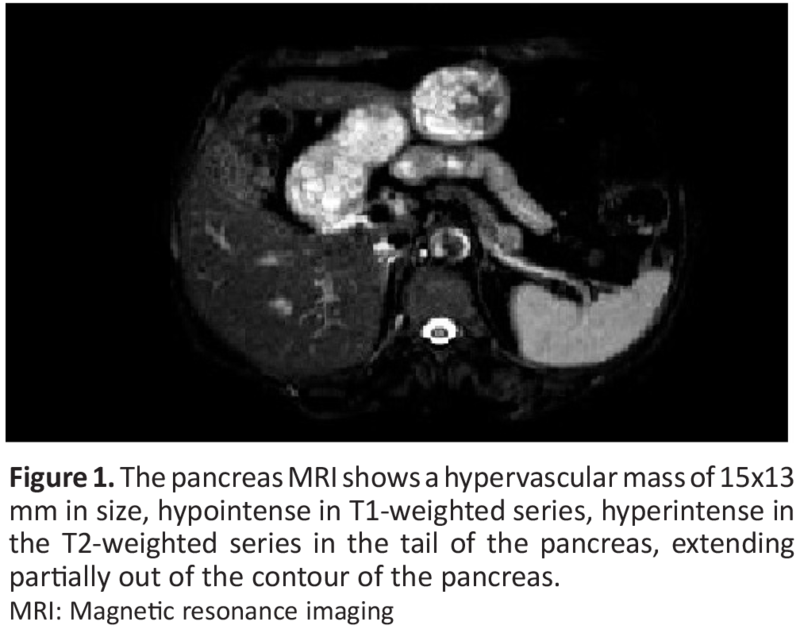 Pancreas MR showed approximately 15x13 mm hypervascular mass lesion in the tail section of the pancreas extending partially out of the pancreas contour, which was hypointense in T1 weighted series. Pancreatic mass was laparoscopically excised in general surgery clinic. In tissue pathology tumour was defined as neuroendocrine tumour grade 1, immunohistochemically positive for chromogranin and synoptophysin, proliferation index was 1%. There were no hypoglycemia and seizures in post op follow-ups. Informed consent was obtained from the patients (Figure 1). Insulinoma is a rare neuroendocrine tumour originating from the Langerhans islet cells of the pancreas (2). Epileptic attacks due to hypoglycemia can be seen in these patients. Acute symptomatic seizure is associated with a systemic or neurological condition. These seizures are not as repetitive as epilepsy. The recurrence of acute symptomatic seizures is not expected unless the underlying event is repeated (3). Both two cases were followed-up in neurology and physchiatry clinics due to epileptic seizures. In insulinoma, clinical symptoms ocur due to hypoglycemia, sweating, tremor, anxiety, starvation and palpitation feelings due to hypoglycemia after exercise or eating, determine the clinical picture. Central nervous system findings occur when blood glucose falls below 50 mg/dL. Confusion, seizure, abnormal behaviours can be seen in patients (4). Patients may be followed up and treated with false diagnoses such as epilepsy or physchosis in clinics due to non-spesific symptoms, like our cases. In our cases, hypoglycemia is probably masked by frequent eating for about three years, neuroglycopenic symptoms may come out after hypoglycemia. But in last months the number of referrals to the doctor because of uncontrolled seizures has increased although high doses of drugs. Patients were referred to our clinic because of the low blood glucose levels observed during seizures in emergency. We made prolonged fasting test to the patients with a close follow-up and the serum glucose, insulin, c-peptide and insulin glucose ratio detected at the third and 4th hours of the test were biochemically suitable with insulinoma. Insulinomas are usually small (<2 cm), solid, 90% benign tumours; they are small and it is hard to localize preoperatively. Conventional computerized tomography (specificity 12-73%) and transabdominal ultrasonographic examinations (spesificity 62%) are relatively insensitive methods in the localization of these tumours and using dual phase computerized spiral tomography can be used to show smaller insulinomas not seen with other radiological methods (6-18 mm). First studies with MR are not promising. Pancreatic Endoscopic ultrasound (EUS) is a non-invazive technique for the localization of pancreatic neuroendocrine tumours and reported sensitivity of 75-96% (5). We performed pancreatic tumour localization with MRI in one of the cases and with pancreatic EUS in other case. As a result seizures associated with acute metabolic disturbance can be separated from epilepsy by lack off the tendency to recurrence and an identifiable cause of seizure. Forth is reason in a patient applying with seizure we should determine if there is a metabolic status or an organic brain lesion underlying to avoid long term unnecessary antiepileptic drug use. Informed Consent: Informed consent was obtained from the patients. Surgical and Medical Practices: M.H.A., Concept: R.Ç., Design: F.G., Data Collection or Processing: F.G., M.H.A., Analysis or Interpretation: F.G., R.Ç., Literature Search: M.H.A. Vig S, Lewis M, Foster KJ, Stacey-Clear A. Lessons to be learned: a case study approach insulinoma presenting as a change in personality. J R Soc Promot Health 2001; 121: 56-61. Burns AR, Dackiw AP. Insulinoma. Curr Treat Options Oncol 2003; 4: 309-17. Imad H, Zelano J, Kumlien E. Hypoglycemia and risk of seizures: a retrospective cross-sectional study. Seizure. 2015; 25: 147-9. Alış H, Akın BV, Kapan S, Turhan AN, Aygün E. Pankreasın Endokrin Tümörlerinden İnsülinoma: Olgu sunumu. Bakırköy Tıp Dergisi 2005; 1: 33-5. Brentjens R, Saltz L. Islet cell tumors of the pancreas. Surg Clin North Am. 2001; 82: 527-42.